This is the second post of a five part series detailing the principles that guide high performance growth teams. Subscribe here to get the rest of the series. This cycle might seem harmless. After all, isn’t getting press a good thing? But what you celebrate (externally or internally) is what your team will think about and focus on. It is giving up the long term, for short term gains. Just don’t do it. 3. A lot of writers in the tech space either don’t know better and/or are writing for page views and attention grabbing headlines and are incentivized to use in-authentic numbers. Let me be the first to say, I’ve been guilty of this in the past. We did it with my first company, Viximo, in the early days. It never felt right to me, but I didn’t know better then. I know better now which is why pursuing Authentic Growth is the second principle for our team. What you measure is what you end up optimizing for. Which is why defining a metric that represents authentic growth is the most important way we apply this principle. The Sidekick growth team monitors a lot of different metrics depending on our focus. They all influence one metric that guides us like our north star. Weekly Active Users. We defined this as our authentic growth metric using a few criteria. Any metric that is intended to be an indicator of overall authentic growth must have a retention built in. Retention is an indicator that you are delivering and building real value because they keep coming back. In the consumer world things like Daily Active User (DAU) and Weekly Active User (WAU) are most commonly used. Celebrating metrics such as total registrations or downloads over time tell you nothing about whether or not you are building real value. Retention is built into our metric since we are tracking Weekly Active Users. If we wanted to bloat our numbers we could by tracking installs or registrations. The second piece of this is how you define retention. In other words, in the case of measuring WAU’s, what would qualify someone as “active?” If you are building a an app or game, metrics such as visits, page views, etc aren’t meaningful. Qualifying events should be meaningful interactions with the product, not just “fly by’s” such as visits or sessions. To qualify as an active Sidekick user, a user must take one of a few high value interactions (not just visit the app) such as tracking an email or scheduling an email. The metric must be relevant to the intended use of your product. If your product is meant to be used daily, then something around Daily Active Users. Weekly, then weekly active users. Etc, etc. This may sound obvious, but I remember in the height of the social gaming craze a lot of companies were really excited by having incredibly high Monthly Active Users. The problem? The games were built to be played on a daily basis. As a result you had games with really high MAU’s, but really low DAU’s that were never able to monetize or retain their users and faded quickly. Sidekick is built and intended to be used by professionals as a key part of their job. As a result we thought that Weekly was the best timeframe to measure ourselves against. Daily felt too strict. Monthly felt too loose because if someone was only using once a month, were they really a valuable user to us? No. Here is the problem…452% growth of something small is still small. Growing something from 10,000,000 to 10,0010,000 isn’t a win. And growing something, but taking an immense amount of time probably isn’t a win either. The point is that there a lot of ways you can frame numbers to make them sound good. Just be honest with yourselves. 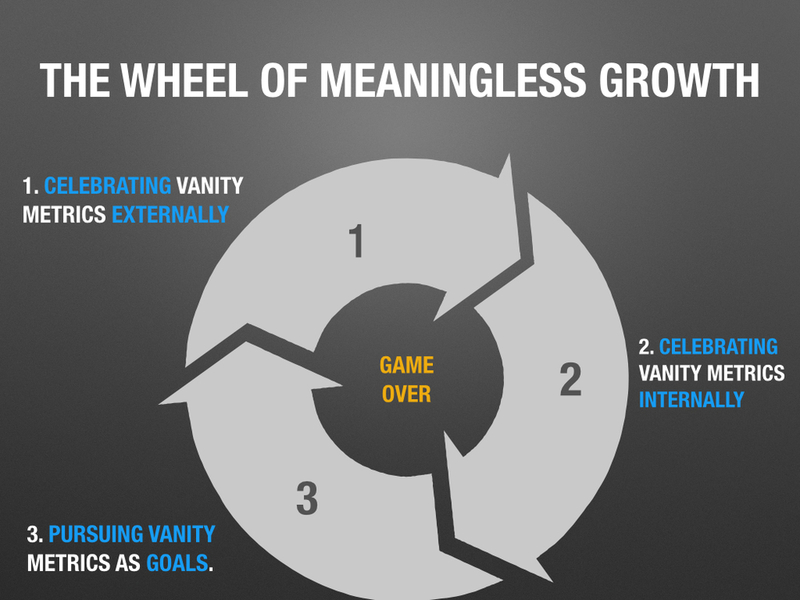 Seeking authentic growth comes down to more than just defining an authentic growth metric. This principle is reflected in our focus, goals, and team structure. One of the most important differences between marketing and growth is understanding that growth is influenced by more than just acquiring new users. You increase growth if you increase activation, retention, referral, and revenue. Commonly referred to as product driven growth. The inter-play between these things is tightly coupled which is why it makes sense to have one team own the understanding of the entire equation rather than ownership live in silo'd pieces. As a result our team focuses on the "full funnel" rather than just the acquisition layer. We set goals around pieces of the funnel (i.e. New Activated Users) that we know influence our core metric of Weekly Active Users. But when measuring success of experiments and increasing our goal metrics we always keep an eye on how it effects other pieces. For example, increasing activation rate doesn't matter if the new users we are activating immediately churn. Since growth does not equal acquisition, the growth team needs to have the right skills to influence the product driven pieces of the equation. This is why half of our team are engineers, designers, or data analysts. A given growth experiment requires a different mix of engineering, design, data, and marketing disciplines. We blend these disciplines into one unit to execute across the funnel quickly and effectively. At the end of the day we do our best to make sure we are being brutally honest with ourselves. Growth means growing the authentic value that we are delivering to users. Not tricking our users or ourselves. This is the second of a five part series detailing the principles that guide high performance growth teams. Subscribe here to get the rest of the series.